In my last two travel-blogs, I told you about the Vikings and Viking activities in Iceland today and the bloody Viking Battles in Skagafjörður. Now I want to show you a selection of the Viking ruins and pagan graves I have visited on my travels around my country. I am very often asked about Viking ruins and have written this travel-blog as a reference to show to people, who are interested in the Vikings and Viking ruins. Most of our Viking stuff is still hidden in the ground, but we have discovered some ruins and pagan graves around Iceland. On the southern part of the Westfjords of Iceland, in Vatnsfjörður at Barðaströnd, the ruins of Hrafna-Flóki are to be found. The Norwegian Hrafna-Flóki Vilgerðarson arrived in 865 in Iceland before it was settled by the Vikings. Landnámabók - the Book of Settlement tells us about Hrafna-Flóki, who is believed to have stayed in Iceland for a year. Not knowing about the harsh, long winters of Iceland Hrafna-Flóki and his men did not know that they had to collect hey as fodder for the livestock, which they had brought with them. The livestock, not having anything to eat, died as a result. Flókatóftir were listed as an archaeological site back in 1930. Flókatóftir is located by Brjánslækur in Barðaströnd in the Westfjords of Iceland. The ferry Baldur stops at Brjánslækur, and it is easy to spot the ruins. 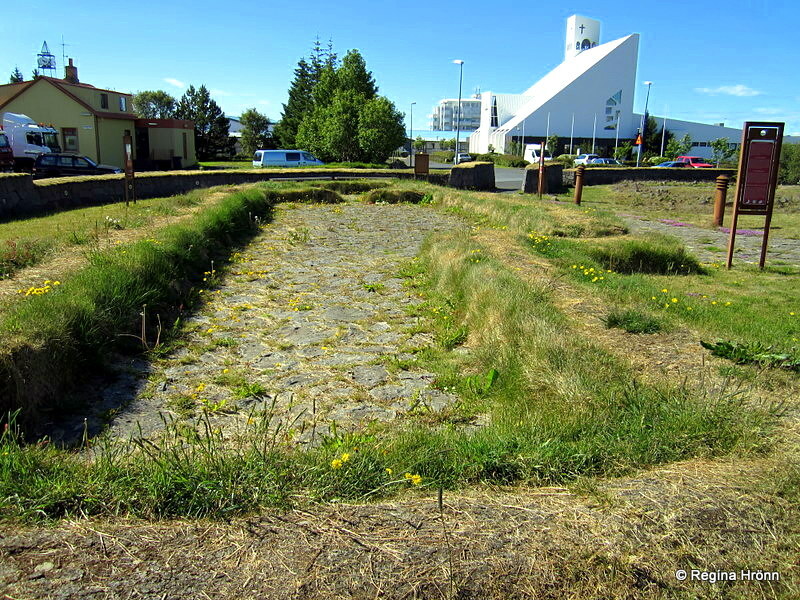 You don't have to go far to see Viking ruins, as we have some in Reykjavík city - and Garðabær town, which belongs to the Great Reykjavík area. Let me first show you the Viking ruins in Reykjavík. In Aðalstræti, the oldest street of the capital city of Iceland remains of a Viking longhouse were unearthed back in 2001. It is believed that this longhouse dates back to around 870. This might even be the longhouse of the first settler of Iceland, Ingólfur Arnarson, who settled Reykjavík. Thus these ruins might be the oldest remains in Reykjavík. The ruins are located in the south end corner of Aðalstræti - Main Street. They were discovered during construction work when a hotel was being built on this spot. The construction work had to be stopped while archaeologists examined the remains. Here in the oldest part of Reykjavík, it is common to find Viking remains while digging for the foundation of a new building. So all construction work screeches to a halt, while the remains are being examined. The solution for the longhouse in Aðalstræti was to build a museum around the remains and the hotel on top if of the museum. When you visit this museum, you will see the open excavations of the longhouse in the middle of the museum. The museum uses interactive technology, and all around the longhouse lit-up images have been added to give visitors the idea of what the view from the longhouse must have been like. Thus you get an idea of what Reykjavík and its surroundings must have looked like back then. At the museum, you will also see Viking artefacts on display, which were unearthed on the site. What I found to be of interest was a small glass fragment, which is the oldest fragment of a Viking Age drinking vessel found in Iceland! A silver bracelet from the oldest layers of human habitation also caught my attention. It is decorative, stamped with triangles with three dots each. The name of the museum refers to the year that Ingólfur Arnarson, the first settler, is believed to have arrived in Iceland - Settlement Exhibition 871 +/-2 means to give or take a couple of years. Check them out at Settlement Exhibition 871 +/-2. Also, check out the Reykjavík City Card if you want to visit this museum and other interesting museums in Reykjavík. The Reykjavík City Card gives you access to many museums and galleries, including the Settlement Exhibition. In Garðabær town, which is a part of the Great Reykjavík Area, a Viking Settlement Age farm was discovered back in 1986. This large Viking longhouse dates back to around 870-930 and is 8 x 30 metres on the outside, but the inside floor surface is 170 sq.m.! It is believed that on such a big farm a wealthy farmer must have lived together with some 20-30 people. We don't know who they were, but it seems to have been inhabited until the 12th century. The owner of this land was Ingólfur Arnarson, Reykjavík's first settler. Around 300 items have been unearthed here, together with an unusual bronze broach pins, knives, instruments and lots of loom-weights and spindle whorls were unearthed in a weaving room. You can visit this longhouse free of charge and have a further look at it. Check out my travel-blog on Hofsstaðir with a lot more photos and information on how to find it. In Þjórsárdalur valley upcountry in South-Iceland, you will find ruins of a real VikingSettlement-Agefarm - Stöng. The Vikings settled here not knowing about the proximity of this area to the notorious Hekla - the Queen of Icelandic volcanoes. Mt. Hekla erupted in 1104 for the first time after the Vikings settled Iceland. This eruption caused havoc in Þjórsárdalur valley of some 22 settlement farms. Eight of these farms were excavated, but only the exceptionally well-preserved ruins of Stöng settlement farm remains above ground - the others were covered again. Additional factors might have contributed to the inhabitants leaving - cold weather and such. Archaeologists excavated the ruins of Stöng back in 1939, but this settlement farm was hidden under layers of tephra. What you can see at Stöng are the stone foundations of the settlement age farm - a Viking longhouse. They have been covered with a red roof and a protective shelter. You can visit the settlement age ruins of Stöng in the summertime, but better still - visit the more accessible Þjóðveldisbærinn Saga-age farm, which is a hypothetical Viking farmhouse, a hypothesis house of the Stöng ruins. The Saga-age farm was erected in 1974 when Icelanders celebrated the 1100- year- anniversary of the Icelandic settlement. I have written another travel-blog on Stöng - Ruins of a Real Viking Settlement Manor and the Reconstructed Saga-Age Farm in Iceland with a lot more detailed information. To visit this area you can rent a car in Reykjavík and make a day-trip of it, as it is located only 122 km away from Reykjavík. A bumpy gravel road will take you to Stöng in the summertime, so a 4x4 is needed. If you will only be visiting the hypothetical Saga-Age farm 2WD is sufficient as the road is paved all the way. Let's always show such Viking ruins utter respect and leave nothing behind. At Eiríksstaðir in West-Iceland, you will find the ruins of a Viking longhouse from the 10th century. Here the Vikings Eiríkur rauði - Erik the Red and Þjóðhildur lived. And at Eiríksstaðir their son Leifur heppni - Leif the Lucky (ca 980-ca 1020) was born. Leif is famous for being the first European to discover America. At Eiríksstaðir a hypothetical Viking longhouse has been erected. Here you can see how the Vikings lived and worked and listen to stories by the long-fire. The hypothesis house was opened in the year 2000, and at the same time, a replica of the Viking ship Íslendingur sailed to America in the trails of Leif the Lucky - some 1000 years earlier. The original ruins are to be found a short distance (some 50-100 metres) above the replica. Here you can see the outlines of the more than the 1000-year-old longhouse. An archaeological digging took place at Eiríksstaðir from 1997-1999, and a small Viking longhouse was discovered, made of turf and rock as was the norm back then. The old longhouse seems to have been hit by a mud-slide and repaired. The last inhabitants most likely moved out by the end of the 10th century. A statue of Leif the Lucky has been erected close to the ruins. I have written another travel-blog on Viking Areas in Iceland - Eiríksstaðir Long House in West-Iceland, with photos from the inside of Eiríksstaðir, the guided tour, and information on how to reach it. In Vatnsfjörður on the northern side of the Westfjords of Iceland extensive Viking ruins have been found. This land was settled by the Viking Snæbjörn, the son of Eyvindur austmann. Vatnsfjörður was one of the wealthiest manors in Iceland in the 12th - 17th century, and here many well-known characters from Iceland's history lived. Ruins of a Viking longhouse were discovered here during archaeological excavations from 2003-2013, along with a smithy and several other smaller houses. Amongst the objects unearthed during the archaeological excavations was an exquisite gold pendant, which could have been from an Irish broach. Also a water jug in the liking of a lion. To reach this area you can rent a car in Reykjavík and drive up here in a couple of days. Here is the location on the map so you won't get lost, as there are two Vatnsfjörður fjords in the Westfjords. This one is in the northern part, but the ruins of Hrafna-Flóki are located by Vatnsfjörður in the southern part of the Westfjords. In the historical Vatnsfjörður in the Westfjords of Iceland - above the Viking ruins - hovers a huge cairn called Grettisvarða cairn. It is believed that the Viking outlaw, Grettir Ásmundarsonar, a.k.a Grettir, the Strong, built this cairn - who else but he could have erected such a huge cairn? Another idea is that it could have been a watch-tower. It is hollow from the middle up, so a fire was possibly lit to warn the neighbours of enemy-approach. Grettir stayed in Vatnsfjörður for some time during his outlawry (which lasted for almost 20 years). Grettir, the hero of the Saga of Grettir, was saved from hanging by the lady of the estate, Þorbjörg hin digra - Þorbjörg the portly, when he had robbed the neighbouring area. A path leads up to Grettisvarða cairn, which was declared as protected back in 1929. From Grettisvarða you will be rewarded with a great view of the bay, the protected hovel with the turf roof and the Viking area. It is quite a magnificent view. Reykholt is one of the historical sites in Iceland, the stately home of the Chieftain and historian Snorri Sturluson (1179-1241) of the powerful Clan of Sturlungar. Reykholt was a cultural and ecclesiastical centre, and here one of the first listed archaeological remains in Iceland is to be found - Snorralaug - Snorri's geothermal pool. This reconstructed pool, which was first mentioned in the Book of Settlements as being in use in the 10th century, is amongst Iceland's best-known heritage sites. And as such, there is absolutely no bathing in it. Next to the pool is the covered underground passage of Snorri Sturluson, which led from the pool and into the manor of Snorri. The underground passage was discovered back in 1931 and the first part of it has been reconstructed. During archaeological excavations, some medieval buildings have been found - the large fortress of Snorri Sturluson. Even the stairs where Snorri was killed by his enemies have been unearthed. Unfortunately, Reykholt has not received enough funding to continue the excavations, and the ruins have been covered with turf. But Snorri's grave can be visited by the old church - or at least we believe that he was buried in this grave. And in the cellar of the new church, you can visit Snorrastofa - an exhibition on Snorri Sturluson and the archaeological excavations. At the exhibition, you can also see artefacts found during the excavations. You can read much more in my travel-blog the historical Reykholt in West-Iceland & Snorri Sturluson - the most influential Icelander. To reach this area, you can rent a car in Reykjavík and drive to Reykholt which is only 108 km away in West-Iceland. In Vopnafjörður in East-Iceland a longhouse from the Viking age was discovered. These ruins, which were found during a dig back in 2006 are adjacent to the current church at Hof. A monument has been erected on the site of the ruins - a big Viking sword and half a shield. It is called Varða Vopnfirðingasögu - the Cairn of the Saga of Vopnfirðingar, erected in 2013. Excerpts from the Saga have been engraved on the shield. The story of the people living in this area from the 9th century until the beginning of the 11th century is told in one of the Icelandic Sagas - the Saga of Vopnfirðingar. As in other places in Iceland back then, there were power struggles between the most powerful clans - here the Clans of Hof and Krossavík ruled - two Chieftains, Brodd-Helgi at Hof and Geitir Lýtingsson and their sons. The women of this Saga were Halla Lýtingsdóttir, Þorgerður Silfra and the Steinvör the Priestess. I gather that the ruins have been recovered with turf, as is often the case, to protect them, as I didn't see them. To reach this area you can rent a car and drive up to the East-Fjords in a couple of days. In the vicinity, you will find one of the main turf-houses in Iceland - the red-painted Bustarfell. In Herjólfsdalur valley in the Westman islands in South-Iceland, the Viking ruins of Herjólfsbærinn - Herjólfur's old farmstead were discovered. It was back in 1924 when the first director of the National Museum of Iceland was doing excavation work in Herjólfsdalur valley that he discovered 3 ruins; one Viking longhouse along with two smaller houses. From 1971-1981 extensive archaeological digging took place in Herjólfsdalur valley- a little bit delayed by the volcanic eruption in 1973. The ruins of 8 turf houses were discovered from around 4-5 building periods. These ruins might have been the farmstead of Herjólfur Bárðarson, the first settler of the Westman islands in around 900. Some of them might even be older. A hypothetical replica of the 10th-century farmstead was erected in 2006 in Herjólfsdalur valley - a longhouse and an outhouse built with turf, wood and rock - it blends in perfectly with the landscape. Read more in my travel-blog Herjólfsbærinn - Herjólfur's old farmstead in the Westman islands. A large Viking longhouse, dating back to 1039-1170, has been discovered at Hofstaðir at Mývatn in North-Iceland. The longhouse at Hofstaðir is one of the largest of its kind yet to have been unearthed in Iceland - the hall is twice the size of that of an average Viking hall, 38 metres long. The earliest mention of Hofstaðir is in year 950 and the last occupants, two brothers, died in 2015. Hofstaðir now belongs to the Icelandic state. At Hofstaðir you will also find ruins of a church, which was most likely built around 1100. Various artefacts have been discovered at Hofstaðir; knives, loom weights and spindle whorls (a very common discovery at such sites), silver, combs, various animal bones etc. There are also speculations of Hofstaðir having been a pagan temple as so many cattle skulls have been found here. I have visited the ruins as we own a summer cottage opposite them, but they are not accessible to the public as they are still under archaeological examination. I often sit on the porch thinking about what this quiet valley must have looked like when the Vikings resided here. I have seen that the use of Hofstaðir is the most common one, but the sign at the farm says Hofsstaðir. You can read more about Hofstaðir here - it is wrongly marked on the Iceland map though. At Skálholt in South-Iceland, the first Episcopal see in Iceland was founded back in 1056. It is one of the best known historical places in Iceland and one of Iceland's most important cultural and political centres from the mid 11th century until the 18th century. In the 12th century, a timber cathedral was erected at Skálholt. At the small museum in the crypt, you will see the most important find at Skálholt - the stone sarcophagus of Bishop Páll Jónsson, who died in 1211. It was unearthed during excavations for the foundations of the new church. A 13th-century tunnel leads to the crypt. This tunnel is mentioned in Sturlunga - the Saga of the Sturlungs, when Órækja Snorrason, the son of the great Chieftain Snorri Sturluson, attacked Gissur Þorvaldsson, in January 1242 at Skálholt. Gissur the Chieftain of the Clan of Haukdælingar was influential in having his former father-in-law, Snorri Sturluson, killed on September 23rd, 1241 - Órækja wanted revenge. Remember the bloody Viking battles in Skagafjörður and the battles between these most powerful Viking clans in Iceland? Órækja was married to Arnbjörg, the sister of Kolbeinn ungi, the Chieftain of the Clan of Ásbirningar. So everybody seems to have been connected in the Age of the Sturlungs, either by blood or by marriage. Next to the cathedral, you will find archaeological ruins of the Bishop's residence, which have been excavated and marked with information signs. They are not Viking ruins, so I don't include them in this travel-blog. rent a car in Reykjavík and drive there yourself. At Keldur in South-Iceland, you will find the oldest remaining structure in my country. It is an underpass, which is believed to date back to the 12th - 13th century from the time of the Age of the Sturlungs. The underpass, which was found by change during diggings for a septic tank, and researched by archaeologists in 1998, leads from the farm and down to the Keldnalækur creek. It might have been an escape underpass or a place to hold down the fort, during the turbulent Age of the Sturlungs. The underpass is 25-metres long. Old ruins of 16-18 farmsteads have also been found at Keldur. Read more in my travel-blog Keldur turf house - is this the oldest house in Iceland? In Arnarfjörður, the second longest fjord in the Westfjords of Iceland, Hringdalskumlið pagan graves were found. It is an old pagan grave believed to date back to the 10th century. It was back in 2006 that a thigh-bone of a man was found here and archaeological excavations began a little later. Five pagan graves were found here with human bones and grave goods. Amongst them a spear-head, a comb, a boss (skjaldarbóla), an axe and a sword. Even a boat grave was found. How we distinguish between pagan graves and Christian graves is that grave-goods (haugfé), animals (horse or a dog) and sometimes boats can be found in pagan graves. That changed with Christianity. The settler of Hringsdalur is, according to legend, Hringur - he lost his life in a battle at Hringsdalur. His burial mound was declared as protected back in 1930 by the director of the National Museum. His mound might have been found here at Hreggnasi in Hringsdalur. That would be amazing - to have discovered the mound of the settler of this area! Seeing that the pagan cemetery is so close to the sea, then there is grave danger that the sea will erode these precious Viking remains. Here you can see the location on the map. To reach this area you can rent a car in Reykjavík, and explore this less-visited part of Iceland. Do take your time - in the past 2 years, I have spent 17 days exploring the Westfjords - and I haven't seen everything yet, which this wonderful part of Iceland has to offer. 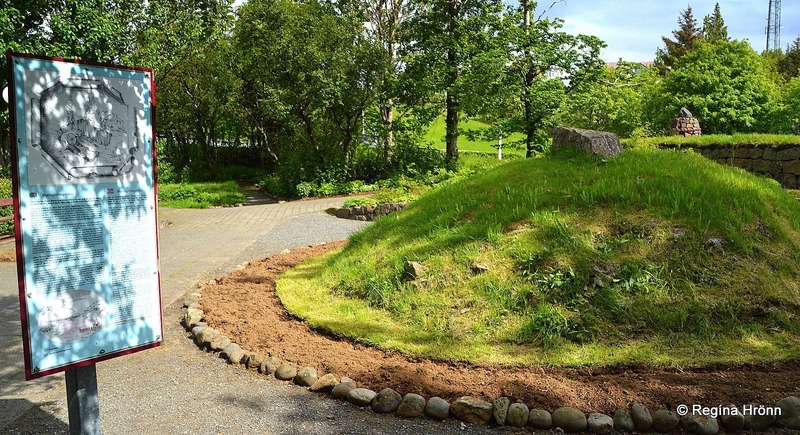 In Borgarnes town in West-Iceland, you will find what we like to believe is the burial mound of the Viking settler Skalla-Grímur Kveldúlfsson and his grandson, Böðvar. Skalla-Grímur was the father of the well-known hero Egill Skallagrímsson of Egilssaga - the Saga of Egill - and Böðvar was the son of Egill. Skalla-Grímur seems to have died of an unknown disease. He was buried with his weapons and tools and his horse, as shown in drawings by the mound. When the teenage boy Böðvar drowned in Hvítá river, his father, Egill, had the burial-mound of his father, Skalla-Grímur, reopened and buried Böðvar with his grandfather. By the burial mound, you will notice a beautiful relief of Egill Skallagrímsson carrying his drowned teenage son Böðvar home on a horse, grief-stricken. In front of the burial mound, you will see one of the nine cairns that mark interesting locations in the Saga of Egill. You can read more about these Vikings in my travel-blog the Saga of the Viking Egill Skallagrímsson, the Settlement Centre & the 9 Cairns in West-Iceland. In 1962, on one of the westernmost points on the Snæfellsnes peninsula, a 10th century, Viking pagan grave was discovered. In the grave a well-preserved skeleton of a man, aged 18-25 was found. This young man had been buried with some of his earthly possessions. This was customary at his time - we call it "haugfé" - grave-goods - the men were f.ex. buried with their weapons and the women with their jewellery and other things. Often horses were buried with their owners. This custom stopped with Christianity and that is how we can distinguish between the old pagan graves and latter time graves as I have told you earlier in this travel-blog. Found in the grave of this Viking was: a 95 cm long sword - but only very few Viking swords have been found in Iceland, an elaborate boss from his shield, a spearhead, a broken knife, pieces of iron and a pin made of bone. The skeleton and the "haugfé" is now preserved at the National Museum of Iceland. I have written another travel-blog on the Majestic Skarðsvík, Saxhólsbjarg & Svörtuloft on the Snæfellsnes Peninsula in Iceland, where you can see the location and how to get there. On the highest point of Hjörleifshöfði promontory in South-Iceland, you will find a Viking burial mound, Hjörleifshaugur, where the remains of Iceland's second settler, are believed to be buried. This Viking settler was Hjörleifur Hróðmarsson, the blood- brother of our first Viking settler Ingólfur Arnarson. The blood-brothers arrived in Iceland in ca 874 AD, and Hjörleifur was killed by his slaves the year after in 875 AD. An hour's relatively easy hike will take you up to the top of Hjörleifshöfði. You can read the story of the blood-brothers in my travel-blog the Historical Hjörleifshöfði Promontory in South-Iceland - Part I - the Blood Brothers Ingólfur and Hjörleifur, where I have added a lot more information and photos plus directions to this historical place. In Melrakkaslétta plains at 66 degrees North, you will find a huge heap of stones - which represents the northernmost protected relics in Iceland, declared as protected back in 1931. This is the burial mound of the Viking Þorgeir Hávarsson - called Þorgeirsdys burial mound. Another burial mound close by is Gautsdys - of Gautur Sleituson. This Burial Mound is mentioned in the Saga of Sworn-Brothers (Fóstbræðrasaga), but in this Saga, you can read about the sleighing of Þorgeir Hávarsson in the first part of the 11th century. Þorsteinn defended himself Viking style and killed 14 of his attackers. Þorgeir's torso is buried in the burial mound, but his enemies beheaded him and carried his head with them to Eyjafjörður as a proof. There were no cameras back then so tangible proof was needed. The same happened to Grettir the strong, he was beheaded, and his head was presented to his mother, who might have buried the head of her son in her backyard - as you have already read in this travel-blog. Þorgeir's torso is not the only dead body in the burial mound as the other victims of this battle are buried there also! I have written another travel-blog on Hraunhafnartangi in North-Iceland - one of the Northernmost Spots on the Mainland of Iceland with more photos and information on the burial mound and directions to this remote place in NE-Iceland. The main trading post in Northern Iceland from the 11th century - 15th century is to be found at Gásir in Eyjafjörður fjord. At Gásir many antiquities have been discovered. Ruins of a medieval church have been found at Gásir - a large church from the 14th century. Not much is known about this church - but we know that back in 1359 it got damaged in a storm. This medieval church is the second largest church to be found in Iceland, some 16 x 5 metres, with a 7-8 metres church-tower. Many ruins of sunken booths have been discovered at Gásir and many things related to trading. It is believed that sulphur was prepared here for export. Gásir is mentioned many times in Sturlunga - the Saga of the Sturlungs. Experimental researches were performed in 1907 and 1986 at Gásir, together with archaeological research from 2001-2006 by the Museum of Akureyri (Minjasafn Akureyrar), the National Museum of Iceland and the Icelandic Institute of Archaeology. When I attended the medieval days at Gásir I got a guided tour of the ruins of the church - that is why my guide is dressed in medieval clothes ;) Gásir is under the care of the Icelandic Archaeological Preservation and is preserved. For more information check out my travel-blog on Gásir and the Medieval Days. Ruins of one of the churches from early-Christianity in Iceland were discovered at Neðri-Ás in Hjaltadalur in North-Iceland. This church might even have been the first church erected in Iceland! In the 10th century, the Viking Þorvarður Spak Böðvarsson lived at Ás. He built a church on his farm in 984 - some 16 years before Christianity was adopted in Iceland. He is believed to have adopted Christianity from the missionary Þorvaldur víðförli, who was the first missionary in Iceland in year 981. Archaeological digs took place at Neðri-Ás from 1998-1999, and these church ruins were unearthed. The church ruins were discovered under the ruins of a smithy, which was beneath the ruins of another structure, which was beneath a sheep barn from the last millennium. The sheep barn had been referred to as bænhúsið - the house of prayer. Isn't this amazing? Ruins of a couple of other medieval churches were also found. The ruins show that these ancient churches were small, only some 12 m2. Þorvarður imported wood for the church from England. Around 100 graves were found by the church - the bones most likely date back to before 1104. Hólar episcopal see in the vicinity was founded in 1106, so the churchyard at Hólar was most likely used from that time instead of the churchyard at Neðri-Ás. A monument has been erected by the road leading to Neðri-Ás. On it is written: "Þorvarður Spak Böðvarsson lét gera kirkju á bæ sínum í Ási. En kirkja sú var ger sextán vetrum áður kristni var í lög tekin á Íslandi. - Kristnisaga". I can translate it to English for you if you want ;) "Þorvarður Spak Böðvarsson had a church erected on his farm at Ás. But that church was erected 16 winters before Christianity was adopted in Iceland. - the Saga of Christianity". The farmers at Efri-Ás have built a heathen temple on their land. I have written a travel-blog on the historical Hólar in Hjaltadalur, where you can see directions to this place. Rútshellir - was this cave used as a Viking temple? In South-Iceland you will spot a peculiar cave in a huge rock by the road. This is Rútshellir cave, which is counted amongst Iceland's most remarkable man-made caves. Back in 1936, Heinrich Himmler sent some Nazi scientists from the SS-troops, Ahnenerbe, to Iceland to investigate Rútshellir. Ahnenerbe was the name of an academic science wing in Nordic science. They were looking for ruins of Viking temples in Iceland with three locations to investigate. They spent the major part of the time investigating Rútshellir cave. They liked to believe, after investigating the cave and writing a thorough description of it, that Rútshellir had been an advanced heathen temple. What they pictured was that the larger of the two caves had been a banquet hall, with the Vikings sitting in a row by the walls of the cave by a longfire in the middle of the cave. They came to the conclusion that the smaller of the two caves had been used for the offering of animals and for the rites. Their theory might be right, or it might be totally wrong, as they were under pressure to find some heathen temples, so I give them the benefit of the doubt and I add Rútshellir to my travel-blog on Viking ruins. Rútshellir cave has been used as storage, for keeping hay and at some point stockfish. And it is believed that people lived in this man-made cave at some time. Read about Rútur, who got killed in the cave in my travel-blog the peculiar cave Rútshellir. Borgarvirki - was this a Viking Fortress? On Vatnsnes peninsula in North-West Iceland, you will find what we like to believe is a Viking fortress from the 13th century, called Borgarvirki -the Citadel. Borgarvirki is a volcanic plug, which forms a natural fortress of basalt columns, to which the Vikings then added. Old folkore tells us that the Vikings used Borgarvirki for Viking military purposes. The fortress is 177 meters above sea-level and 10-15 meters high. The people of this area seem to have used Borgarvirki as a fortress when they were under attack from the chieftains of Borgarfjörður in the 13th century. At least on two occasions the local people of the Húnavatn's district were under siege here. The opponents' strategy was to starve the locals out. The locals had run out of food during one of the attacks and overheard the attackers talking amongst themselves how much provision the Húnavatn's locals had left. Their leader, Víga-Barði, came up with a strategy to get rid of the attackers. Provisions were running out, and only one piece of meat was left. Víga-Barði had his people throw that piece of meat out from the fortress, giving the attackers the idea that they had plenty of provisions left. In this natural fortress, you will find lading, which has been rebuilt and is declared as protected. Find out more in my travel-blog on Borgarvirki Fortress in North-West Iceland - a Viking Fortress. To reach Borgarvirki turn off ring-road 1 onto the road 711. Then turn left on 717, which is 8 km of a bad one-lane road with hard shoulder and several blind hills. Include Hvítserkur monolith in your visit. Hidden away up in the screes of Mt. Öxarnúpur in North-East Iceland you will find the Viking lair of the outlawed Viking Grettir sterki Ásmundarson - Grettir the Strong (ca 996 - ca 1040). His saga is told in Grettissaga - the Saga of Grettir. Grettir is amongst other things famous for having been an outlaw for almost 20 years! The Icelandic laws back then demanded that outlaws would have fulfilled their punishment after 20 years outside in the harsh Icelandic nature. Grettir was killed in Drangey island only a couple of months before he would have regained his freedom. The so-called Grettisbæli - the Lairs of Grettir can be found in several locations around Iceland. I found one of his lairs hidden away in the 146 m high basalt column mountain, Öxarnúpur, in Öxarfjörður fjord. To reach the lair, you will have to hike up some scree to the top of a protruding rock. Once you have reached your destination on the rock, you will see a small lawn and the lair. This stronghold of Grettir the Strong is small, the height and width is only 1 metre, and the length is around 3 metres. It was probably well insulated by Grettir. The lair is half-covered with five heavy basalt columns, which form a roof over the lair, one of which is broken. Only Grettir the Strong could have covered his lair with such heavy basalt columns. What a lonesome and hunted life Grettir, who was afraid of the dark, must have lived here. Having read the Saga of Grettir in college then I think it is pretty cool to be able to visit one of his lairs hidden away up in a mountain. I have visited two more of his lairs, in Drangey and the one at Vígabjarg rock in the Jökulsárgljúfur canyon. I have written another travel-blog on the Lair of the Viking Grettir the Strong in Öxarnúpur in North-East Iceland with many more photos and directions. At Bjarg in North-Iceland, you will find the birthplace of the Viking outlaw Grettir the Strong (ca 996 - ca 1040) - and a grave with his head. Grettir was an outlaw for almost 20 years and for the last three years of his life he lived on Drangey island - and there he was slain in around 1040. Some remains from his time on the island can be seen there. The way he was killed after so many years of being hunted as an outlaw, was that a witch cast a spell on a log - which then landed on Drangey cliff. Grettir needed firewood, and as he was about to chop up the log, the spell caused his axe to land on his food and cut it badly - causing it to swell up and turn black. The enemies of Grettir - the Viking Þorbjörn Öngull with his men - climbed up the steep cliff of Drangey with the intention of killing the wounded Grettir. Þorbjörn Öngull took Grettir's sword and cut off Grettir's head with his own sword :( He then presented the head to Grettir's mother, who might have buried it in the grave and covered it with a rock. Öngull wanted to bring the head of Grettir to Alþingi at Þingvellir, but the way he killed Grettir when he was ill from the spell, would have been frowned upon. You can read more about Grettir's story in my travel-blog on Drangey Bird Cliff in North-Iceland and the Viking Grettir the Strong. To reach this area you can rent a car in Reykjavík and drive to Laugarbakki in some 2.5 hours. Include Borgarvirki and Hvítserkur in your visit. Remains of an 11th - 12th-century turf-wall can still be seen in South-Iceland. It is called Bjarnagarður - the Wall of Bjarni and is one of the biggest preserved man-made structure from the Viking times in Iceland. It is written in the Icelandic law book from 1281, Jónsbók - the Book of Jón that everybody should build a wall around their hayfield. The wall was presumably erected to protect the pastures legally and to keep farm animals inside. The 8-10 km long wall was built around the year 1200 and has collapsed through the ages, but parts of it are still visible - I am walking inside parts of the wall in my photo above. I think the original wall would have been my height when it was still standing. Hörður has also erected a replica of Bjarnagarður wall in front of the Bunker of ash layers. It is 50 metres long and gives us an idea of how massive this wall was. Hörður calls this wall Mórallinn or the Guilty conscience, and you can read in my travel-blog Hotel Laki and its Amazing Surroundings in South-Iceland how that name came about. Þingvellir was the ultimate Viking place, as here the Vikings from all around Iceland gathered for two weeks every summer for their parliament, Alþingi, which they founded in 930. Alþingi operated at Þingvellir until 1798 and Þingvellir is a very sacred place to us Icelanders. Unfortunately, there is not much to show for it, and not many Viking ruins of camps have been discovered, so I have no photos apart from of Þingvellir itself. Parts of stone and turf ruins of some 50 booths have been found, mainly from the 17th and 18th century, but the Viking booths are buried somewhere. The Icelandic flag in my photo below marks what we like to believe is the spot where Lögberg - Law Rock was located. Snorrabúð - the booth of the Chieftain Snorri goði, is believed to be next to the Law Rock. And Njálsbúð - the Booth of Njáll is on the west bank of the river, opposite Þingvallabær residence, while Biskupabúð - the Booth of the Bishops is north of the church. I wish we could see the ancient booths as they were back then - I would f.ex. love to see the booth of Egill Skallagrímsson of the Saga of Egill. It is quite an experience though exploring Þingvellir and imagining what it must have been like when the Vikings convened in this location. But it is a bitter-sweet experience, as so many people were executed at Þingvellir. There were no executions here in the Viking time though, as punishments back then were performed in the home districts. The punishments at Þingvellir started in the latter part of the 13th century. At Þingvellir the assembly set laws and disputes were settled - here the Lawspeaker was the main authority. He was appointed for 3 years at a time and a part of his role was to read out loud from Lögberg - Law Rock 1/3 of the laws each year - until they were written down. The noted Snorri Sturluson and his nephew Sturla Þórðarson of the Clan of the Sturlungar were Lawspeakers at Þingvellir at some point. Icelandic Vikings from all over Iceland got to meet at Þingvellir - and some love affairs started here, f.ex. between Gunnar and Hallgerður from the Saga of Njáll. Þingvellir is situated on an active seismic zone and here the tectonic plates are visible above ground, so that adds to the experience of visiting this historical place. The valley has sunk some 3-4 metres since the Vikings were here - and it moves apart some 2 cm each year. Þingvellir is declared as protected and a UNESCO Viking site since 2004. The distance to Þingvellir from Reykjavík is only 50 km and it is part of the Golden Circle. In East-Iceland you can visit the ruins of Krakalækjarþing assembly on Þinghöfði cape. Krakalækjarþing assembly is mentioned in chapter 4 in Droplaugarsona Saga. It was one of 3 spring assemblies in East-Iceland. These spring assemblies were held for 4-7 days in May from 930-1262. All in all, there were 13 assemblies in Iceland; 3 in the East, West and South, but 4 in the North. East assembly had 3 Chieftains - so Iceland had 39 Chieftains, sometimes more. There was also an autumn assembly at Krakalækjarþing, which was held after the annual summer assembly at Þingvellir, where the Vikings gathered for 2 weeks in June for a general assembly. At the autumn assembly, changes in laws made at Þingvellir were announced. Ruins of 20 booths and other structures can be seen at the old assembly site and when you walk around this area you will clearly see many ruins covered by moss and vegetation. Krakalækjarþing got its name from the wealthy Kraki, who lived at the old farm Krakalækur. His daughter, Helga, was said to be the best and fairest of all the women in Fljótsdalshérað. Krakalækjarþing assembly is by road 925. Some Viking artefacts have been discovered in pagan graves and by chance. 21 Viking swords have been found - 14 of them in pagan graves dating back to the 9th and 10th century. I recently attended a lecture on Viking swords at the National Museum and got these numbers at that lecture. You can see some of them on display at Þjóðminjasafn Íslands - the National Museum of Iceland, together with other Viking artefacts found in pagan graves. One of the Viking swords was found by chance by two goose-hunters back in 2016. Another one was found in June 2017 at Dysnes in Eyjafjörður. A little bit further I add a photo of that Viking sword. More Viking artefacts are on temporary display at the museum, f.ex. the extraordinary find in 1938 in East-Iceland - of the still preserved cheek of a Viking woman - referred to as Bláklædda konan - the Woman in blue. The remains of this Viking woman, who is believed to have died in the 9th century, were found in her pagan grave with some grave goods. She was laid to rest with her left cheek touching a copper broach, which prevented the flesh from decaying. It is indeed a rare find! Pieces of cloth, blue in colour, were also preserved due to the poisons in the broach - but blue was a common colour for Viking women to wear. You can see the two convex copper broaches of the Woman in blue in my photo above, but several such broaches have been found in pagan graves in Iceland. At the exhibition, you will also see the chin with the flesh, preserved in formaldehyde. I attended a lecture on the Woman in blue at the National Museum of Iceland and after the lecture, we were guided through the exhibition. In May 2018 another temporary exhibition opened at the National Museum on the extraordinary archaeological artefacts discovered at Dysnes in North-Iceland, where 2 boat graves were found, a Viking sword and armour, a silver ring, broaches and a myriad of nails from the boats. Here is a video of when the archaeologists dug out the very fragile Viking sword. At our National Museum, you will see the skeleton and the grave-goods of the so-called Hafurbjarnarstaðarkuml - the pagan grave at Hafurbjarnarstaðir in Hafnir in SW-Iceland. At Öndverðareyri on the Snæfellsnes peninsula, ruins of a Viking longhouse from the Settlement age have been discovered. At Hrísbrú in Mosfell in SW-Iceland a longhouse from around the Settlement of Iceland has been discovered. And a church from around 1000. The Saga of Egill tells us that Grim of Mosfell built a church at Hrísbrú around the year 1000. It was demolished when a church was built at Mosfell. Under the altar of the old church, some big human bones were found, which people believed were the bones of Egill Skallagrímsson himself. (Ref. Antiquity). At Þórarinsstaðir in East-Iceland remains from an early Christianity church were unearthed during excavations. Only a couple of such churches have been found. At Glaumbær in Skagafjörður ruins of a 33 m x 8 m Viking longhouse were discovered, some 150 metres from the current turf house. At Úthlíð upcountry in South-Iceland, a pagan temple was built in around year 900. The ruins can still be seen - or so I have heard, as I haven't seen them yet. In Ólafsdalur in Gilsfjörður in West-Iceland ruins of a Viking longhouse were discovered in 2018. It is believed that they date back to the 9th or 10th century. At Geirsstaðir in Hróarstunga in East-Iceland a Viking longhouse; a manor and a church were discovered in 1997. The church was most likely erected around 1000. A hypothesis turf church was built in 1999-2001 at Geirsstaðir, in the liking of the ruins of the church unearthed. At Árbæjarsafn Museum in Reykjavík excavations have unearthed the ruins of walls of outhouses of the Árbær farmstead dating back to 1226. Excavations are still underway as you can see in my photo below. Many pagan graves have been found around Iceland - some 320 graves! Below you will see grave goods from a boat grave in Vatnsdalur in Patreksfjörður in the Westfjords of Iceland. It is believed that a Viking woman was buried with her boat and that six more people were buried with her later on. The grave goods are on display at the National Museum. Bæjarklaustur, Þingeyraklaustur, Munkaþverárklaustur, Hítardalsklaustur, Flateyjarklaustur, Helgafellsklaustur, Þykkvabæjarklaustur, Kirkjubæjarklaustur, Keldnaklaustur, Saurbæjarklaustur, Viðeyjarklaustur, Möðruvallaklaustur, Reynistaðarklaustur and Skriðuklaustur. I have visited many of these ruins but will be including them in another travel-blog, as they are not Viking ruins. To visit some of these Viking ruins, you can rent a car in Reykjavík and drive around Iceland. Also, check out the self-drive tours on offer.